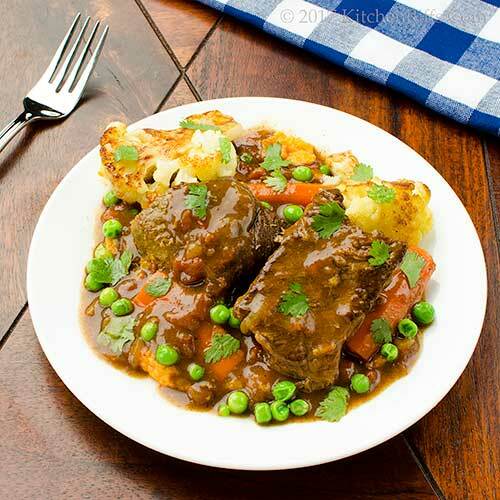 Think beef stew is boring? Meet Moroccan Beef Tagine. It has cinnamon, cumin, paprika, cayenne – and they all come out to play. They give this dish savor unlike any other beef braise you’ve had. And we pump ours up even more with frisky veggies. Prepare to wow your guests. Many countries have some sort of stew or braise that is traditional to their cuisine. In Morocco, it’s tagine (AKA tajine), which is the name of both the stew-like dish and the conical-shaped vessel used to cook it. But tagine is easy to make in your own kitchen, and you don’t need a special cooking dish. 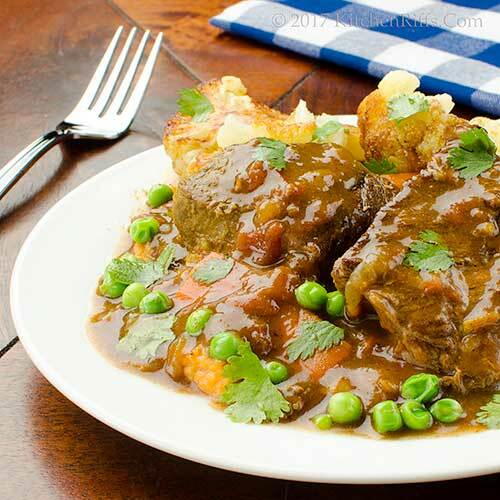 Just think of it as beef stew with a flavor twist, and cook it in a Dutch oven. You can make this recipe with any vegetable, BTW, not just the ones we use. Or skip the veggies entirely if you want a meat-centric dish. Traditionally, the sauce for a tagine is not thickened. Tagine is a communal dish, one where everyone eats from a common serving platter rather than individual plates. Diners use fingers rather than utensils. Typically, they start by dipping bread into the sauce and sopping it up, waiting for the meat and veggies to cool enough so they won’t burn their fingers. Once the sauce is gone, diners proceed to the main event. But we’re serving individual portions on plates, so we’ve elected to thicken the sauce. And instead of relying on bread to sop it up, we like to serve it over mashed potatoes. Or especially over Chipotle Mashed Sweet Potatoes – the spices in the tagine work perfectly with the richness of sweet potatoes. This dish would also work well over Polenta. This recipe is adapted from one we found in our favorite Moroccan cookbook, Paula Wolfert’s Couscous and Other Good Foods from Morocco. The original book has been out of print for a while, but a revised edition is available. Prep time for this dish is about 30 minutes, and cooking time adds another 1½ to 2 hours (largely unattended). You can make this dish a day or two ahead of time, then finish it off the day you plan to serve it. This dish serves 6 to 8. Leftovers keep well for a few days if refrigerated in an airtight container. Cut the meat into chunks of whatever size you prefer (we often use larger chunks – about 2 by 4 inches). Pat the meat chunks dry with paper towels, then season with salt and pepper. Heat a large Dutch oven over medium stovetop heat. When hot, add the oil. Brown the meat on each side – it’ll take 5 to 8 minutes to brown each side. Don’t crowd the pan (do this in batches if necessary). When the meat is browned, drain it on a paper-towel covered plate. While the meat is browning, peel the onion and cut it into dice of ½ inch or a bit less. Set aside. Peel the garlic and slice it thinly or mince finely. Set aside. Scrub the carrots and peel them. Cut off the tips. Cut the carrots into pieces of about 3 inches (if the carrots are particularly thick, cut them in half lengthwise first). Set aside. When all the meat is browned, add more oil to the Dutch oven if necessary. Add the chopped onion, season to taste with salt, and sauté for 5 minutes. Then add the chopped garlic and carrots, and brown another 3 minutes. Add the browned meat back to the cooking pot. Add the spices (turmeric, cayenne, paprika, ground ginger, cumin, and cinnamon), along with the broth and the diced tomatoes. Bring the mixture to a simmer, then taste and adjust the salt if necessary. Set a timer for 1½ hours. When the timer goes off, test the meat (it should be almost done). Add the cauliflower, cover the cooking pot, and set the timer for 15 minutes. When the timer goes off, add the peas, and cook until all the veggies are done (another 10 minutes). If you want to thicken the sauce: While the veggies are cooking, mix the cornstarch with cold water. Wash and dry the parsley and/or cilantro, and mince it finely. When the tagine is finished, remove from it from the heat and stir in the cornstarch mixture (if using). Spoon mashed potatoes onto serving plates (or use another starch, such as Chipotle Mashed Sweet Potatoes). Spoon beef tagine over the potatoes, arranging pieces of meat and veggies artistically. Then ladle on some sauce. Sprinkle with chopped parsley and/or cilantro garnish (if using). We usually make this dish with boneless chuck or shoulder roast. In Morocco, cooks typically use bone-in cuts. If you want to go that route, try short ribs. If you want to make this dish ahead of time, we recommend cooking it for 1½ hours (through Step 7). Let it cool, then refrigerate the dish until ready to continue. Resume with Step 8 when you’re ready to serve the dish. We sometimes squeeze a bit of lemon juice over each dish right before serving. It adds a nice acidic touch. We often use Roast Cauliflower in this dish (instead of cooking cauliflower with the meat; and in fact that’s how we made it for this post). If you’d like to do this, simply follow our recipe for roasting cauliflower, then add it to the tagine right before serving. We like to cook carrots with the tagine because they help flavor the sauce. We add the rest of the veggies near the end. Prefer to substitute other veggies? Try zucchini, turnips, or Jerusalem artichokes instead of cauliflower and peas. This dish is spicy, but not hot (in fact, many Moroccan dishes are not particularly hot). Increase the cayenne pepper if you want more fire. We use kosher salt for cooking. It has larger crystals than regular table salt, making it less salty by volume. If using regular table salt, start with about half the amount we recommend. But always season to your taste, not ours. Traditionally, tagine is cooked in an earthenware, cone-shaped vessel (also called a tagine). The vessel has two pieces. The bottom is a shallow circular base that holds all the ingredients. The top is a cone-shaped lid – the shape helps return the condensation that’s caused by the cooking process to the bottom of the dish. A Dutch oven or similar cooking pot works equally well, however. A Moroccan host would bring the bottom part of the tagine vessel to the table (it doubles as a serving dish). Guests reach into the dish, using the fingers of their right hands to eat. Messy business! But at a Moroccan dinner, it’s common to have a hand-washing ceremony at the beginning and end of each meal. “And no greasy fingers dropping beef chunks in my lap,” I said. Truth. Even though Moroccans might dismiss it as forked up. Hahaha! I like plates and silverware too :). Although I might not mind digging into this deliciousness with my hands. It looks fabulous! The aroma in the kitchen has to be phenomenal while this is cooking away!! And I'm with you on needing silverware to eat this, though I would love some bread dipped in that sauce! Hi Kelsie, plates and silverware are GOOD! :-) Thanks for the comment. Hi Liz, bread dipped in the sauce is a good thing -- in fact the sauce may be the best part of the dish. Thanks for the comment. Hi Pat, this dish has a really nice flavor profile! Good stuff. :-) Thanks for the comment. This sounds amazing John. I haven’t used my raging in ages. 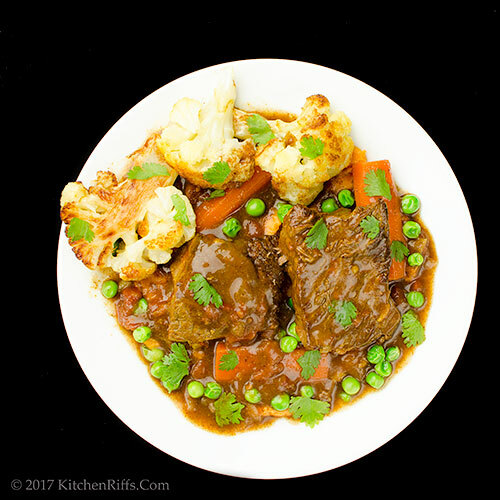 I’d love to try your recipe using short ribs and chipotle mashed sweet potatoes. It sounds heavenly no think I’ll give it a try this week. Hi Vicki, the chipotle mashed sweet potatoes are wonderful with this! Thanks for the comment. I really like the idea of serving the tagine over the chipotle mashed sweet potatoes...a nice complement of flavors. Hi Karen, the flavor really work well together. :-) Thanks for the comment. Hi Lea Ann, the sweet potatoes are winners! As is the tagine. :-) Thanks for the comment. I am loving all the spiced dishes lately. This looks so hearty and comforting while still being pretty healthy. Love it! Hi Laura, we've been playing with our spice cabinet lately. :-) Thanks for the comment. This is pure heaven, looks and sounds so delicious. The smells would be divine. And yes, some silverware would be good or crusty bread, yum !! Hi Asha, the aroma of this is really enticing. :-) Thanks for the comment. 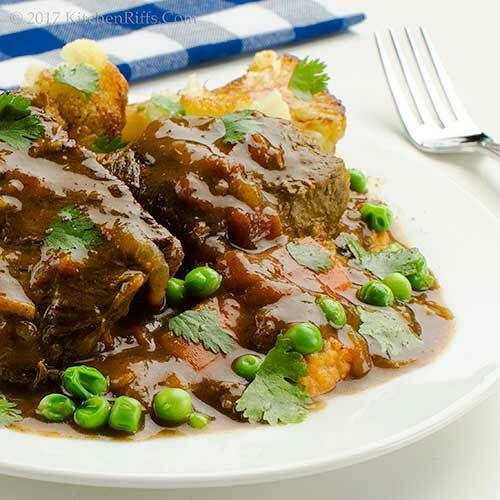 Thank you for sharing this amazing stew! I love all the spices and the story behind the dish. Sounds like something my family could dig into! Hi Tricia, bet your family would love this! :-) Thanks for the comment. LOVE tagine, more than couscous. Your beef tagine looks delicious...interesting about the mashed potatoes choice! This looks like such a hearty meal. I think this would be nice paired with some rice. Hi Evelyne, I've had both tagine and couscous numerous times, and much prefer a tagine. A more interesting dish, IMO. Thanks for the comment. Hi Peachy, I've never served this with rice, but that's a terrific idea! Thanks for the comment. All those spices must make this dish phenomenal . I like the mashed potatoes and some silverware. Hi Gerlinde, the flavor of this is outstanding. :-) Thanks for the comment. Great recipe. I love tagines. So pretty and the food in them is too! Perfect fall fare, preferably with that fork! Hi Abbe, tagines are terrific fall fare! So nice and warming. :-) Thanks for the comment. I don't think I've ever had anything like this. Haven't eaten much Moraccan. This does look awesome but what really took me over the edge was that you served it all on top of a bowl of mashed potatoes! WHOA!!!! I'm there! Thanks for introducing me to a new dish John! I wish I could cook half as good as you, John. I adore Moroccan spice and this must have tasted marvelous! I love stews in the cooler months and a spicy tagine is the only way to go. I love the ease, the flavors, that warming comfort food feeling - fabulous dish! Looks and sounds mouthwatering! Love the flavors. Mmm, the tender beef and warm spices ... I can almost taste it! It's supposed to snow here in CO today--this is a perfect recipe for such a day. Well done, John. I love love love love love the looks of this! LOVE IT! I have definitely wanted to try TAGINE for a very long time and this recipe right here is giving me that opportunity! I need to buy ingredients for another recipe today so I may very well just pick up some for this one too! Hi MJ, we like to serve everything on top of mashed potatoes. :-) Thanks for the comment. Hi Angie, Moroccan spices are wonderful, aren't they? And this dish is terrific! Thanks for the comment. Hi Robyn, this is pure comfort! :-) Thanks for the comment. Hi Lydia, the flavors of this are SO GOOD! One of those dishes that will haunt you. (Appropriate for the season, huh?) Thanks for the comment. Hi Judy, this is wonderful snowy weather fare! Enjoy. :-) Thanks for the comment. Hi GiGi, tagines are wonderful! Love the way they're flavored. :-) Thanks for the comment. Hi Greg, Ethiopian food is wonderful, isn't it? Never cooked any -- should try sometime. Thanks for the comment. So many great flavors in this dish... it looks great John! Hi Pam, it's a good one! :-) Thanks for the comment. Love everything about this dish and the combo of spices you used are some of my favorites. Bet your kitchen smelled magical, happy fall! Hi Cheri, the aroma of this cooking id drool-worthy. :-) Thanks for the comment. Exploring Moroccan flavors is really a great thing to do, and I'm very tempted to try your adaptation. My efforts to use those spices have all been quite delicious, and this would be another promising experiment. Quite a few Moroccan dishes include sweet potatoes, as far as I know, though the recipes I've seen use them right in the stew pot. John, this is the prettiest thing I've seen all week! I need to make this soon. When I first looked at the picture, I was thinking I'd serve this over polenta. But then you said sweet potatoes, and YES, sweet potatoes! Oh those flavors! All the warming spices of autumn hovering above creamy mashed potatoes, sublime. Hi Mae, you're right -- sweet potatoes are in a lot of Moroccan dishes, including beef tagines. We like to serve the tagine over the sweet potatoes, though -- that way we get the flavor, and use the potatoes as a starch to soak up some of the sauce. Thanks for the comment. Hi Jean, the sweet potatoes are wonderful with this, although polenta is really nice too. :-) Thanks for the comment. Hi Deb, those spices are dynamite! :-) Thanks for the comment. I went to Morocco some 27 years ago and I loved the local kitchen! This beef looks perfect! Hi Taruna, lamb/mutton tagines are actually more popular than beef ones in Morocco. Enjoy! :-) Thanks for the comment. Hi Katerina, I lived in Morocco for a period back in the 1970's -- the food there is wonderful, isn't it? Thanks for the comment. John...Totally In love with this recipe, the flavors, spices and the SAUCE! We are doing the low carb thing and as much as the chipotle sweet potatoes sound amazing, the roasted cauliflower as a side would be lovely too. Hi Bobbi, the flavor of the tagine and roast cauliflower work wonderfully well together. Really good stuff! :-) Thanks for the comment. this looks amazing and I love that you are serving it with chipotle sweet mashed potatoes.. what an excellent combination!! This looks amazing!! I have been in a rut with my dinners lately, and this one looks like a winner! Hi Dahn, the tagine + sweet potatoes = wonderful flavor combo! Thanks for the comment. Hi Cathleen, it IS a winner! :D Thanks for the comment. Now this is my type of dish! look at that delicious sauce over that tender beef. Love this with couscous! Hi Raymund, the sauce is SO GOOD! :-) Thanks for the comment. I really enjoy Moroccan food a lot and this recipe looks delicious and perfect for a cold evening. Hi Amy, isn't Moroccan food so good? Love the spices! Thanks for the comment. Sitting here in my Canberra kitchen, sipping coffee... I almost want to grab a fork and dive right in to your sumptuous tagine. Lovely post. Gorgeous recipe. Hi Liz, isn't this nice? SO flavorful! :-) Thanks for the comment. I love, love Moroccan food and make it quite often! This looks delicious! Hi Katerina, Moroccan food is so nice, isn't it? Wonderful flavors! Thanks for the comment. I would totally be into the silverware-less method. Especially the part where you soak up the sauce with bread. I could live on gravy and bread. Hi Jeff, I have eaten this using my fingers -- and it's actually rather fun, But awfully messy! And it's always good to soak up sauce with bread, isn't it? :-) Thanks for the comment. Hi Carolyn, yup, this is good stuff. :-) Thanks for the comment. This tagine looks like such a delish and comfy meal. I am so much loving the spices you have used here. And those roasted cauliflowers are the perfect addition. I am sure it tastes as delicious as it looks. Thanks for a lovely recipe John. Hi Anu, roast cauliflower really goes well with beef tagine! Nice combo of flavors. :-) Thanks for the comment. Sounds like a wonderful meal with so much flavor. Hi Dawn, this has a TON of flavor. :-) Thanks for the comment. Hi Merryn, braised dishes have so much flavor, don't they? Particularly with these spices! Thanks for the comment. John, this looks OUTRAGEOUSLY delicious! I LOVE Moroccan flavors and spices. And serving it over those smoky sweet potatoes! Even better. No utensils or fingers for me. I'll just face plant! Thanks for sharing this beautiful recipe! Hi Anne, well let it cool a bit before you plant your face. :D And the sweet potatoes are wonderful with this! Thanks for the comment.